The Consumer Electronics Show is on again in Las Vegas for its 50th anniversary. The organizers have re-branded it as CES and media reviewers were asked not to refer it by “Consumer Electronics Show” because of the broader range of technology represented at the show rather than electronics. CES is huge and even bigger than last year with more attendees (over 170,000) from over 150 countries and over 3800 exhibitors. We were told there is more media here than were at the Olympics. When compared to the first show 50 years ago which had 115 exhibitors and 17,000 visitors, the growth is amazing! One of the trends to watch according to Shawn DuBravac, (chief economist of the Consumer Technology Association) is the increasing use of voice user interface (VUI) that will replace the traditional graphical user interface (GUI). This is possible because voice recognition has drastically improved from 1995 when the error rate for speech recognition was 100 per cent; in 2013 it was 23 per cent and today has a speech recognition error rate of closer to zero. DuBravac described how intelligent assistants like Amazon Alexa already have over 1500 applications using VUI and the number of apps are increasing daily. The next step will be the ability to differentiate individuals by voice, which will allow VUI to be used as a security enabling measure. 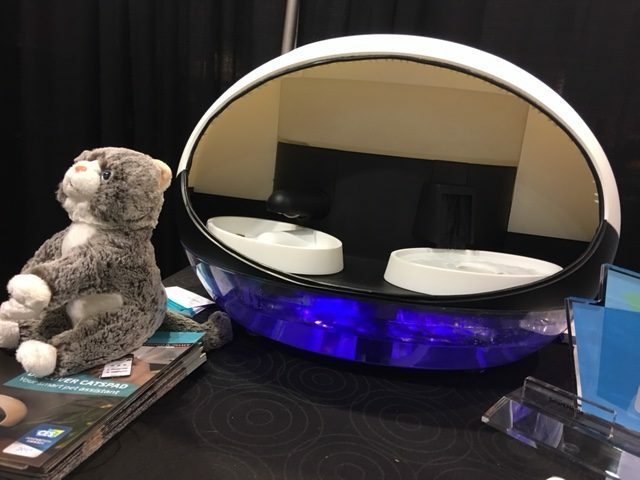 CES had several special events for the media, including CES Unveiled and Discover Blue, where about 90 companies displayed their products. These are usually startups in the crowd funding stage who paid extra to get the media’s attention before the show opens when they are just one of the 3500 exhibitors. There were the usual displays of watches with various fitness measurers, speakers and tracking devices. There were some new products, mostly serving special interest groups such as pet lovers and fishing enthusiasts. The prices cited for all the devices described below are in US dollars, a moot point now that the Canadian dollar is down to 75 cents. Anglr is a fishing information tracker, and can be described as a “fitbit for fishing”. It’s a 2″ sized device that attaches to the fishing rod and transmits information (such as catches, weather conditions, water conditions and catch location) to the smart phone. It sells for $129.99 and the target audience is avid fishermen. Link AKC is technology designed for the dog lovers. 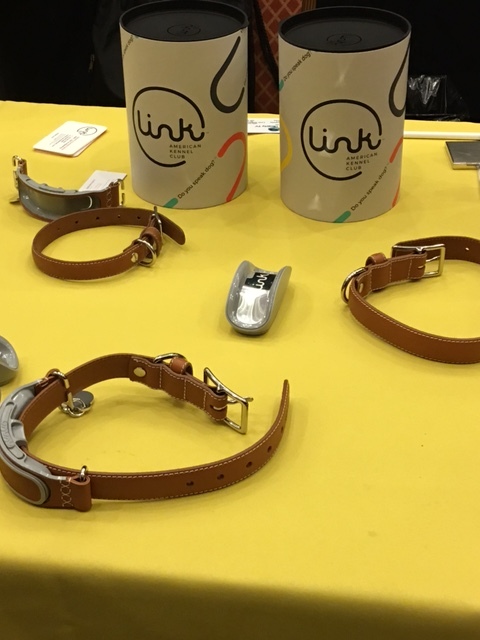 The device is a lightweight unit that is easily attached to the dog collar and allows the owner to stay connected with the dog using an app on the smart phone. If the dog is lost, a GPS tracker can highlight the dog’s location. Owners can also set up a GPS safe zone and receive notifications if the dog wanders outside it. Notifications can be sent if the room is too warm or cold. The dog’s overall health can be managed via the app. Tracking the dog’s exercise, or recommendations of changes in exercise level based on breed and age are available as well as reminders for vaccines or other health care needs. The collar attachment holds a charge up to 5 days and is easily recharged. They retail at $199 and will be available to customers later this year. Not to be outdone, Catspad is advertised as the smart assistant that monitors your cat and helps him/her stay healthy. It consists of electronically monitored water and food bowls. With the app on the smart phone, the owner can control it anytime, as well as how often and how much the cat is fed. The app makes it easy to dispense food at any time, or specific times can be set up so the feeding is automatic. Feeding the cat whenever the bowl is empty is another option since this can theoretically help to keep dogs out of the cat’s food bowl. It monitors the level of dry food and water intake and notifies the owner when either is low. The cost is projected at $249 and will be available next year. As a person who has a rather spoiled cat, I would not get this device, unless my cat was overweight or sick. But let’s get serious. One of the more worthwhile projects exhibited in the start-up section is Gaspard. It is a smart connected mat, which is placed on the wheelchair under the cushion. Gaspard analyses the body posture for the person sitting in the wheel chair to determine whether s/he is sitting in the correct position. 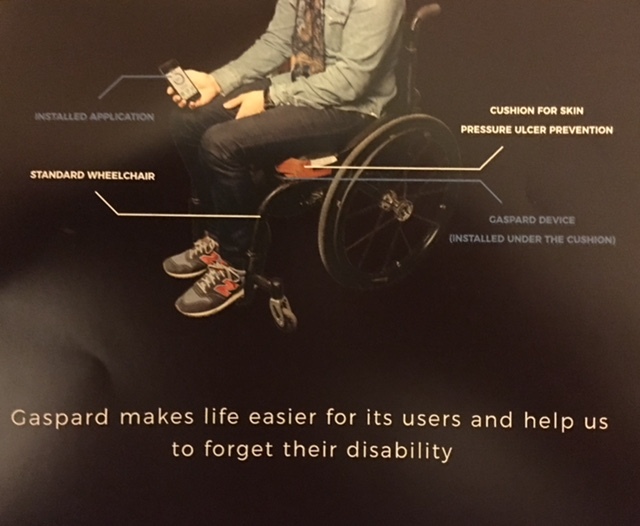 This data allows Gaspard to detect a bad position that may cause discomfort on his wheelchair and recommend changes. Gaspard will be available next year and the cost is projected at $200-300. The products described above provide just a sample of the over 3500 products that will be demoed at CES. I will look at some of the products that are not usually covered by mainstream media. Stay tuned!